Hello, hello! And happy Sunday! I have spent the entire morning working at my new standing desk (which I got on Craigslist for $30, whaddup), trying to figure out how to make my blog more beautiful and efficient for you. My conclusion is that it's gonna have to wait. I am so busy these days with school, promoting my second book (pre-order your copy now!) and trying to maintain a life that I don't have the time to build a whole new website... yet. However, I want you to know it is something I am planning on doing. I wanna update my recipe index, take better pictures, give you more recipes, focus on putting out great YouTube videos (like recipes demos and FAQ's), and in general just keep improving This Rawsome Vegan Life. I hope that's cool wit you. Don't worry - I'm not gonna turn it into some bland, generic webpage. TRVL is my heart and soul and I always mean to show that in this cyber corner of the 'net. But you don't wanna hear about me and GALANT here wishfully searching for unicorn HTML code... you wanna hear about granola. 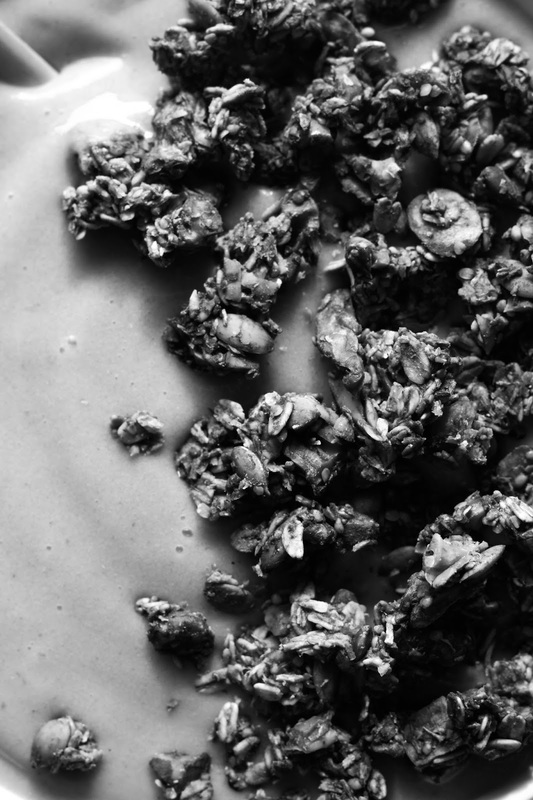 Let's talk about granola. This recipe is the bomb! It's crunchy, flavourful, sweet, healthy and uber easy to make! Seriously, I winged it and it ended up being hippie perfection. You can keep this raw in the dehydrator with buckwheat groats or take it easy and use rolled oats and your oven at a low temperature. I did the latter because when it comes to food, I'm easy. I used to love granola and cereal for breakfast, but when I began gravitating towards a more whole foods-centered diet, out of the cupboard they went since they were full of sugar and other stuff my body just doesn't need. 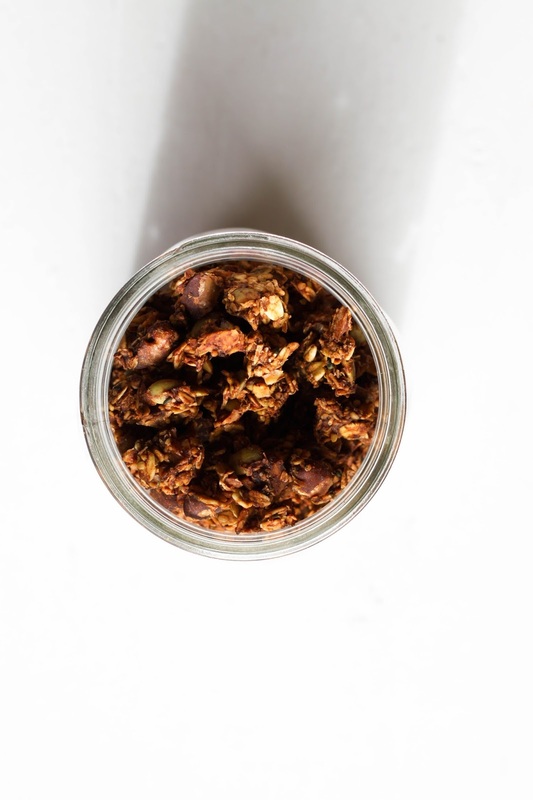 This recipe satisfies the granola-lover in me without sacrificing my healthy food standards. Try it out, see what ya think. The smoothie is also rockin'. I had never had persimmons until a few days ago, and my oh my - they're delish! So sweet and like a gooey, creamy, fruity, orange pudding. I threw a few in the blender with bananas and berries and enjoyed that with my fresh "baked" granola! It was like I died and went to healthy cereal heaven. Seriously, try having your fave cereal or granola (i.e. this recipe... hehe) with nut milk or a smoothie: YES. To make the granola: soak the nuts (and buckwheat groats, if using) in water for 8 hours, then drain and rinse. Throw the nuts, seeds, coconut and oats into a large bowl and set aside. Blend together the dates, water and spices. If it's still too thick, add more water. (The consistency of my date mixture was like thin yogurt.) Pour this into the large bowl and evenly coat all the dry ingredients in it. Spread out on dehydrator trays and dehydrate for 2-3 hours at 115 degrees, until it's crunchy. Or do what I did: "bake" at 250 degrees in your oven for 2 hours and get the same delicious result. Store in jars. To make the smoothie: blend everything until smooth! 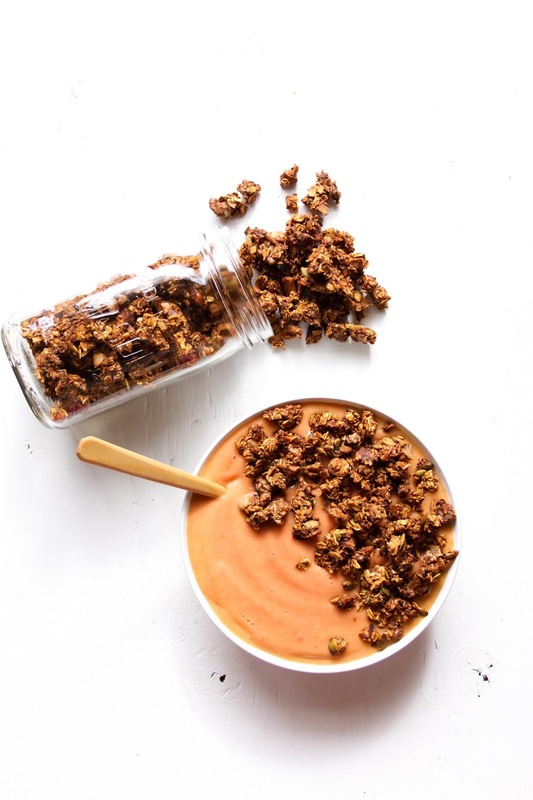 Pour into a bowl and sprinkle with your granola! With school and other activities on the way, it's not surprising that you are very busy. But I hope you can still find the time to come up with your new website. This will be a great help when you launch your second book, and in updating your readers with the latest events and stuff you're working on. But for the meantime, you can still give them updates through your other social media accounts. Cheers! I made this granola with banana purée instead of syrup. A+!